Roland EGX-20 engraving machine is remarkably easy to operate, especially for beginners. The Roland EGX-20 makes it possible for anyone to produce beautiful, professional text and graphics right from their computer. The Roland EGX-20 engraving machine is large enough to accommodate a wide range of engraving jobs from custom awards, product serial numbers, office directories, personalized item, and more. However, the Roland EGX-20 is still small enough to fit comfortably on your desk and takes up no more space than your standard office printer. Roland EGX-20 engraving machine is the perfect solution for beginner engravers. 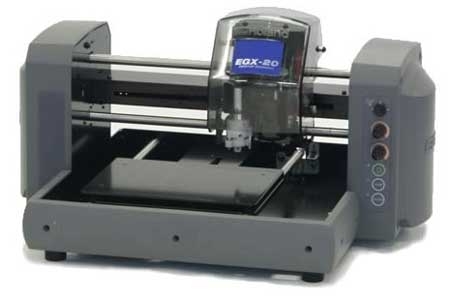 The Roland EGX-20 was designed especially for the novice engraver. Its intuitive joystick and dial control makes engraving easier than it has ever been. The joystick controls the X, Y, and Z axis for smooth, accurate engraving. The Roland EGX-20 engraving machine hooks right up to your computer or laptop and sits right on your desktop for quick accessibility. Setting up and completing your first engraving is equivalent to the time spent configuring a new printer. The Roland EGX-20 engraver includes everything you need to get started including a complete suite of engraving software. Roland EGX-20 engraving machine comes equip with a 15,000 rpm spindle powerful enough to engrave a wide variety of materials. The Roland EGX-20 easily engraves on acrylics, PVC, ABS, polycarbonate and wood. With the use of the adhesive hold down sheets, securing the material to the worktable is easy. With the optional diamond drag and burnishing adapter, you can also scribe light metals such as aluminum and brass for making personalized items such as; nameplates, plaques, name tags, and awards. Once you select the material to be engraved from the menu in the software, the Roland EGX-20 engraver automatically determines optimum cutting speed and tool path, assuring smooth and accurate results. Among the most revolutionary of the Roland EGX-20s features is its Automatic Surface Tracking System. Roland EGX-20 engraving machine uses AST to automatically track the height of the material to ensure engraving at a constant depth, even on bowed or non-uniform surfaces. While most engraving machines force you to set the origin point and cutting depth through extensive trial and error, the Roland EGX-20 makes the process effortless. The Roland EGX-20 lets you produce consistently beautiful results with less learning time and less wasted materials. Included with the Roland EGX-20 engraving machine is a complete suite of engraving software. Prior to production, Virtual MODELA simulates finished shapes for previewing. Lighting effects, material color, and bitmap overlays can be added to represent the finished products. Virtual MODELA can even accurately estimate engraving time. 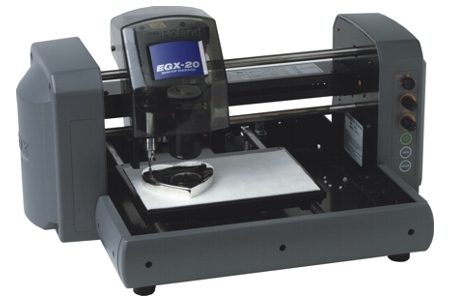 In addition, Roland EGX-20 comes with Dr. Engrave software. Dr. Engrave converts Windows TrueType fonts into single-line fonts for scribing so you won’t need to purchase new ones. For multiple plate applications, Dr. Engrave has an automatic layout function that allows you to import an Excel CSV file and places columns of information into predefined text boxes. In this manner, Roland EGX-20 engraving machine can produce an entire door numbering project or corporate name tags in which variable or sequential data is needed. A “V” cut function outlines borders for easy separation of individual plates. 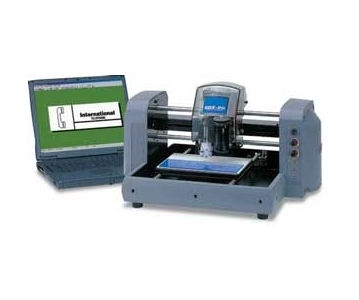 Dr. Engrave even accepts scanned images; such as company logos, directly from your scanner and computer for engraving. Last but not least, Roland EGX-20 comes with 3D Engrave. 3D Engrave adds thickness to bitmap images to create reliefs. With 3D Engrave, you can even specify different engraving depths for various objects in a single design for added creativity. With all this great software included at no additional charge, you can be assured to get the best use out your Roland EGX-20 engraving machine. Roland engravers have earned a worldwide reputation for reliable performance and outstanding results. Like all Roland products, they come with an international ISO certification. This signals Roland’s commitment to offering top quality products backed up with first-rate customer service and a wide variety of supplies and accessories. Works great, a little confusing at first with the centering and stuff but it works fine. I purchased EGX-20 model of desktop engraver. They did the sample for us and it looked amazing. I am unable to repeat the same quality of the name plate engraved as they did in the sample. After I call the support, they are kindness and professional to help me go through the setup step by step. After that I am able to completed the engrave task with good quality from my aspect. It is a good support and service team they had from my experience with them especially Jesse Davis. The provided instructions were a little hard to understand but the phone support we received and their providing us with a formatted file for our existing name plate got us going very quickly. Great product! I am very satisfied with the engraver I purchased. Their customer service was outstanding as well. They went out of their way to ensure I got my machine up and running and that everything was working properly. I purchased an engraver and have had great support with everything from delivery to setup and the help support group is nothing short of an A+. They spent an hour and a half helping me with setup and making sure the machane was set up correctly for my use. Thank you Jesse for all your help. Best customer service I have ever dealt with. They went out of their way to make sure I had everything I needed for my machine and that it was running perfectly. Extremely knowledgable and helpful. I would recommend Engraving Machines Plus to anyone! Danny and Jesse did a fantastic job! Danny helped me find exactly the product we needed, handled a complicated payment/shipping request and walked me through the set up process. Jesse spent a good part of a day making sure I understood the machine/software and getting file setup for me. We walked through the engraving process with several test runs until we got it just right. The final product looks great! Software is easy to use. Messed up first attempt, after that is has been easy to do. Machine is small and compact, good for our location. We use it for name plates on Industrial Water conditioning equipment. Perfect product for our needs! . Great Reccomendation by Danny and Engraving Machines PLUS...Super fast, curteous, and knowledgable! Amazing customer service!!! Thank you for taking such care to walk us through the process of our needs, to the sale, to delivery and set-up. We couldn't be more appreciative. Just started using the product today. It is working great. It does exactly what I needed it to do and what was advertised. The best part of the transaction was the customer service. Jesse spent 1.5 hours working with me so, that I would understand all the features. It did not require that much time to be able to use it. However, I had lots of questions and he answered them. Danny was exceptional to work with as well. right machine at the right price. I work for an oil & gas drilling contractor in remote Alaska. We do not have easy or timely access to engraved tags and signs for our drilling equipment on site. We contacted Engraving Machines Plus and discussed the products they had to offer. We ordered and received the Roland EGX-20. The EGX-20 is a perfect fit for our operation. The customer service has been excellent. Great machine and even better customer service, a combination that is hard to find. I recently purchased a Roland EGX-20 to engrave machine specification labels, push button labels, etc. for machining centers and other equipment. The EGX-20 definitely meets our needs, as we've been able to produce several high-quality and highly visible plastic labels for some of our new equipment. The machine and software are very user friendly and easy to learn, and the folks at Engraving Machines Plus have been very helpful. I highly recommend. Anyone looking for an engraver I would highly recommend Danny Martinez and Engraving Machines Plus. I was just recently given a task at work that I had no idea how to complete. I sent a request in on the web site and Danny called back the next day. He was able to evaluate my task and recommend a machine and process. When I got the machine with a couple of calls to Danny, I was making parts the same day! Great Support. Thanks Danny, Your The Man. Danny was very helpful in making suggestions on what unit would work best for my personal application after receiving the engraver the setup was very easy. We have been using the EGX-20 for a little over 2 weeks and have engraved aluminum, ABS plastic, and scribed tempered steel with great results. Outstanding product...more importantly, outstanding service. I had trouble getting started with the hardware and software. One phone call to Danny Martinez solved all of my problems. He remoted into my computer and stayed on the phone with me for nearly an hour to ensure we were 100% operational. I cannot ask for better service! I look forward to doing business with the company for years to come...keep up the good work! I was looking for an engraving machine that was simple and professional to do industrial tags. I called and spoke with Danny, who is very knowledgeable and polite. He helped me find the right machine for the job, helped me sized all the materials, and made the set up effortless. I chose to by this engraver from this site because the reviews said the customer support was amazing, and they weren't kidding. Danny is a fantastic and so is my engraver/tags.